Mercury dental fillings, also called amalgams, have been used in dentistry for over a hundred years, even though mercury is known to be a toxic metal. Dental amalgam is usually a mixture of 50 percent mercury and 50 percent other metals (copper, tin, silver and zinc). It became widely used because of the special way mercury binds with the other metals and is still malleable. 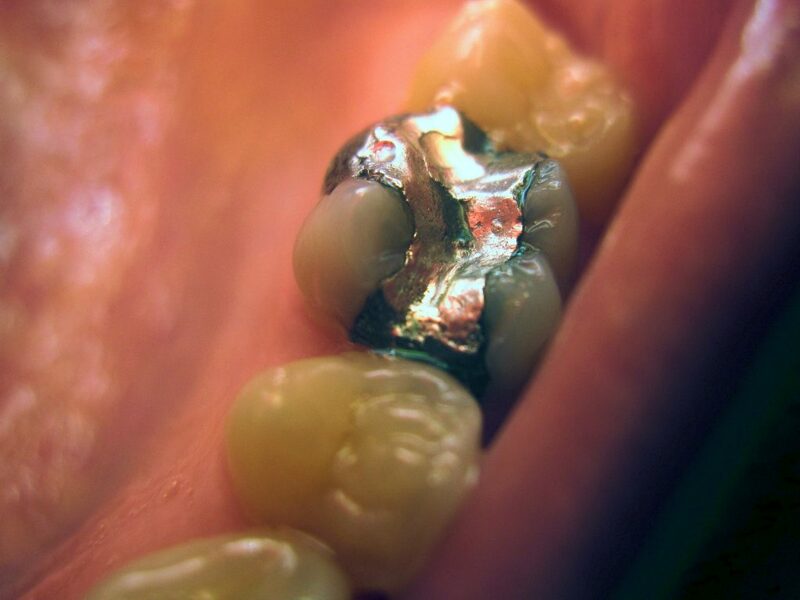 These types of mercury fillings are also referred to as ‘silver fillings’, but make no mistake, ‘silver fillings’ still contain mostly mercury. If you have any fillings in your mouth that are metallic in color, you likely have mercury fillings. Mercury exposure is known to have long lasting negative effects throughout your body. Mercury toxicity has been linked to many neurological disorders including multiple sclerosis. 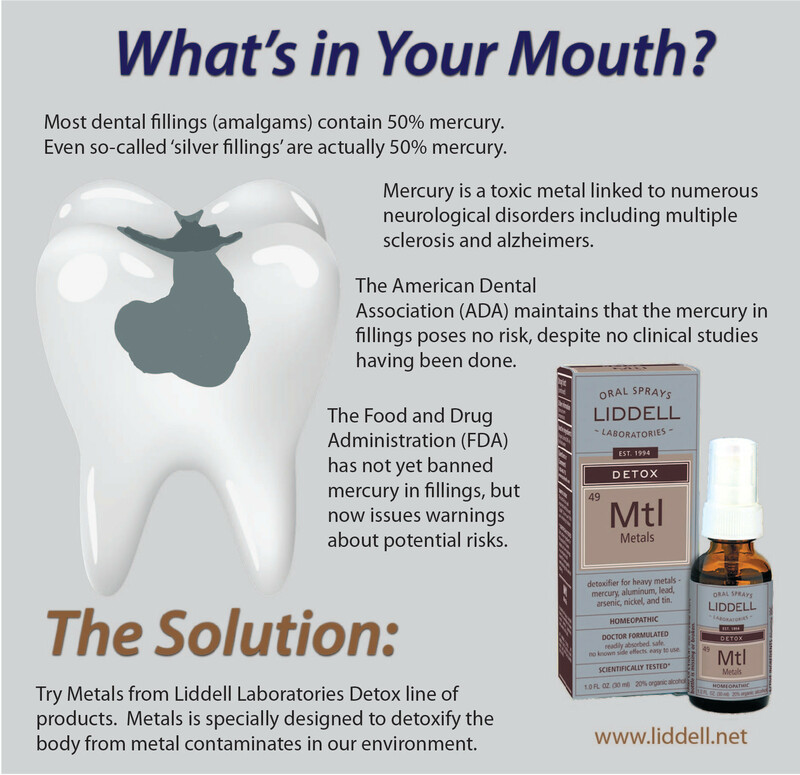 However it should be noted that the American Dental Association (ADA) maintains that the mercury in amalgam fillings is safe and does not leak mercury vapor, however no clinical studies confirm their claim. 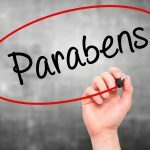 The Food and Drug Administration (FDA) has not banned these mercury fillings (yet), but in response to the growing public outcry, it now issues warnings on their website about potential risks. What can you do about the potential hazard in your own mouth? You can have fillings removed, but removing them can also be hazardous if your dentist does not have the correct training and equipment to mitigate the mercury vapor that will be released as they are disrupted. If you are not sure if your dentist is properly trained or has the right equipment, what else can you do? We at Liddell Laboratories suggest using our Metals Detox homeopathic formula. This is a specially designed product that detoxifies the body and temporarily relieves the symptoms associated with toxic metal residues (such as those in dental fillings). But your exposure to mercury and other toxic metals certainly isn’t limited to your fillings; you can also be exposed to mercury through vaccination, ocean fish, and common CFL light bulbs. 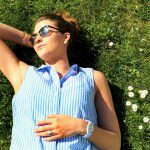 It is scary to think how many toxins can contaminate our bodies just in daily life, but it should also be reassuring to know that there are steps you can take to protect yourself and mitigate the damage.